If you stop for a moment and think back to your childhood home, or any home you may have visited as a child, you will likely remember more details about the kitchen than any other room. This is because the kitchen is, and pretty much has been for the last several decades, the most important room in a house. The kitchen was the place where you sat at the table and did your homework, it was the place where you ate your after school snack and it was the place where you watched your mother cook meals while you eagerly awaited breakfast, lunch or dinner. Things haven’t changed much over the years, except now you sip wine at the kitchen table reading your books instead of drinking chocolate milk. Since your family spends so much time in the kitchen, it is important that it fits your personality. Your kitchen should be a reflection of who you are and what you stand for. And while the style of your kitchen was quite suitable for the previous owners, it in no way reflects who you are. 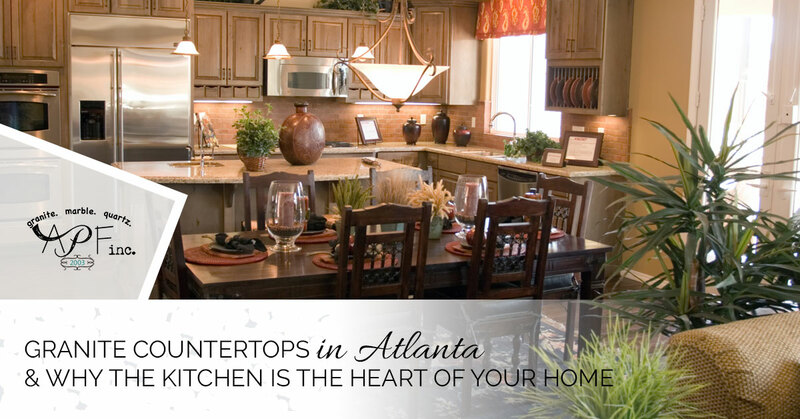 This is reason enough to have your kitchen remodeled and have A Polished Finish install granite countertops in your Atlanta home. Long ago, kitchens were places most people would avoid. They were dark and sooty places where rodents roamed and mean ladies prepared bland-tasting meals. They were places where the servants worked. More recently, the kitchen became a woman’s domain, a separate part of the house in which the matriarch could drink coffee, cook meals and talk to girlfriends on the telephone while chain-smoking Virginia Slims. Of course, back then, cooking was viewed as a chore, a necessity that every wife and mother had to endure. But that changed when the popularly of cooking shows inspired a generation to stop popping things in the microwave and create wonderful dishes. Cooking shows inspired us to cook and made us more interested in well-equipped kitchens. Even people who don’t entertain want nice appliances to cook their meals. When the seasons change and the leaves fall, families retreat to their kitchens and it becomes the heart of their home. Your kitchen provides the perfect space for fun family activities. Cooking and baking are great bonding experiences and gives everybody the opportunity to get a little messy. Cooking and baking can be bonding time and time when getting dirty isn’t frowned upon. There are many private rooms in your home where family members can go to escape. Dad loves hanging out in his den and mom can be found in her room designated for scrapbooking, but each member of the family utilizes the kitchen every day. Technology has played a role in the popularity of the kitchen. Laptops, tablets and smartphones have brought people from bedrooms and offices where desktops were used into the kitchen. Now, children can do their homework and teens can keep in touch with their friends through social media all while sitting at the kitchen table drinking chocolate milk. There are only so many things you can do in the bathroom or even in the living room, but you can do everything in the kitchen. Watch a movie, write a paper, cook a meal, finish a science project, it can all be done in your kitchen. If you stop and think about it, there is really only one thing you can’t do in the kitchen. Food nurtures the body, mind and soul. Without food, we would not survive. Your kitchen provides a place to prepare the foods that give you energy and nutrition. And in this age of children and adults being obese, going out to eat too often isn’t a healthy option. You want to do the right thing and prepare healthy and nutritious food for your family in your kitchen. You also want to pass these healthy eating habits to your children. The kitchen is the heart of any home and the most important room for the family to gather. Therefore, you will want your kitchen to be a nice place where family members feel warm, secure and at home. Contact A Polished Finish and see what we can do for you to help improve the look and feel of your kitchen.